Experience a North Myrtle Beach vacation the way it was intended; reside across the street from the oceanfront during your stay in our beautiful seaside North Myrtle Beach resort. Shore Haven II offers two-bedroom North Myrtle Beach condominiums with two baths. These condos are in a quiet North Myrtle Beach resort that is just across the street from panoramic views of the beautiful blue Atlantic Ocean. 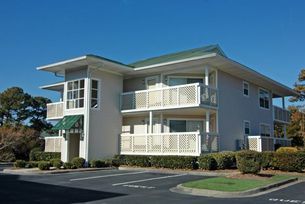 Shore Haven II is a lakeside North Myrtle Beach resort with tastefully decorated condominiums that sleep six or seven people. You may never leave your nicely appointed North Myrtle Beach vacation condo at Shore Haven II, though the ocean waves crashing against the shore and the seagulls soaring in all directions are inviting sounds that lure vacationing families outside where they can walk in the warm sand with bare feet. Pick a spot to spread out your beach towel on the white sand and get a front row seat to the oceanfront activities that make North Myrtle Beach, South Carolina so popular. People of all ages swim in the beautiful water and kids surfing the waves on a boogie board is a common site along the 60 miles of sandy beaches for which North Myrtle Beach, South Carolina is known. Because you have a full kitchen in your two bedroom North Myrtle Beach vacation condo, you can easily prepare a picnic that can be enjoyed beachfront, either on your private balcony or down on the sand where the sun can shine on your face. Shore Haven II is a North Myrtle Beach resort that also has a sparkling swimming pool that is perfect for a refreshing dip after spending an afternoon on the golf course or running and playing on the beach. Favorite family attractions, such as water parks, amusement rides, miniature golf, ice cream shops, unique stores, waterfront dining and dinner theatres are only minutes away from your oceanfront North Myrtle Beach condo rental at Shore Haven II. It is a dream vacation situation, complete with comfortable furnishings, fully furnished kitchen, convenient amenities and superb North Myrtle Beach, SC location. And Shore Haven II invites you to enjoy an inspiring North Myrtle Beach vacation the next time you visit North Myrtle Beach, South Carolina. Elliott Beach Rentals is not affiliated with onsite management or the HOA of Shore Haven Ii.